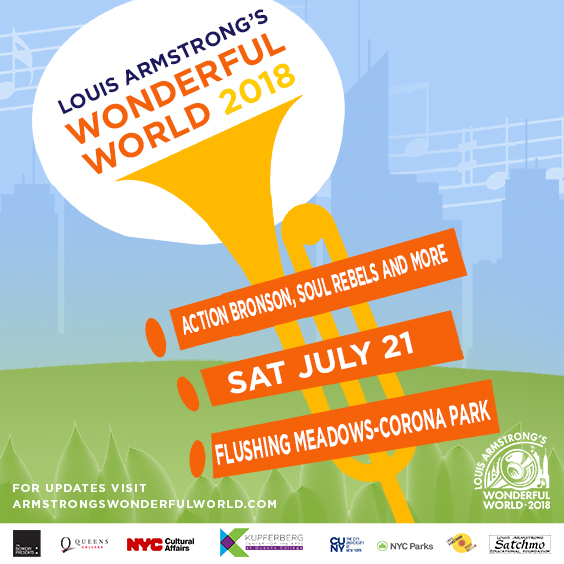 Enjoy the music of Louis Armstrong this summer during the fifth annual Louis Armstrong’s Wonderful World Festival. Held on Saturday, July 21 at the historic Flushing Meadows Corona Park — the same borough where Louis Armstrong lived for more than 20 years and within walking distance of his former home, this year’s festival will be headlined by Queens rapper, Action Bronson. Bronson, who shares a home borough with Armstrong and has been hailed over the last decade as “one of the most promising prospects in New York hip-hop” (NYT). The rapper’s flamboyant phraseology, explosively charismatic nature, and entrepreneurial spirit make him one of the most exciting acts in the music world today. In addition to the musical line-up, the festival will include food trucks, activities, and more, all paying tribute to the legacy of Louis Armstrong. Additionally, Ricky Riccardi, the Director of Research Collections at Louis Armstrong House Museum and author of “What A Wonderful World: The Magic of Louis Armstrong’s Later Years,” will host lectures and appear at the festival’s Louis Armstrong House Museum tent. The free festival will kick off at 4PM. A limited number of VIP tickets are available for $25, which includes a private viewing area and access to premium restrooms.